Zagreb, Ljubjana, Bled, Rovinj, Plitvice, Zadar, Split, Dubrovnik, and more! Explore Croatia & Slovenia, an Eastern European countries with a long coastline on the Adriatic Sea, home of 1000+ islands, historic Old Towns and a laid-back gay scene. An earthly paradise of snow-capped peaks, turquoise-green rivers and Venetian-style coastline, Slovenia enriches its natural treasures with harmonious architecture, charming rustic culture and sophisticated cuisine. If your Mediterranean fantasies feature balmy days by sapphire waters in the shade of ancient walled towns, Croatia is the place to turn them into reality. Explore Croatia's capital and largest city. Zagreb has a rich history and is home to beautiful architecture, café culture and a compact gay scene. • Buffet Breakfast and be ready to explore the capital and biggest city of Croatia. • Zagreb walking tour starts from Zagreb walking tour starts from Zagreb’s main square – Ban Jelacic Square named after our 19th century viceroy and national hero, Josip Jelacic. 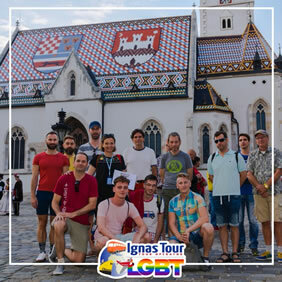 • Your personal and Gay friendly tour guide will introduce you how Zagreb grew from two historical medieval settlements of Kaptol and Gradec into a city called Zagreb. Not only that you will walk through both of them will you hear stories and legends about them. • First you will visit Zagreb's Cathedral the most secrete church in Croatia. Then Dolac a beautiful market with its red umbrellas. • Before Upper town of Gradec you will visit street where it use to be Red light district, then Tkalciceva street, which is the most charming street in Zagreb and here you will find hundreds of cafes and bars. • After crossing the border between the two settlements, you will enter Upper town through the only preserved medieval gate, the Stone Gate. • In Gradec, you will get a chance to see St. Mark’s Church with its famous coloured roof, the baroque church of St. Catharine’s and 13th century Lotršcak tower and more. • At the end of our tour there is an option to use Zagreb’s Funicular, originally built in 1890, and known as the shortest funicular in Europe but also the oldest public transport in Zagreb. • We will end out tour where we started in fort of monument at the main square. • Dinner on your own and overnight at your hotel in Zagreb. 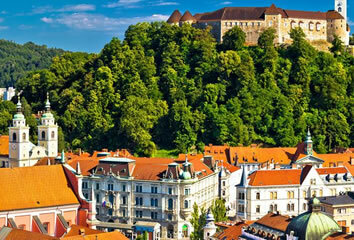 • Buffet Breakfast and departure to Ljubljana, the capital of Slovenia. • Are you ready for an amazing tour of Ljubljana? Start your incredible tour from the Town Hall, whose unique architecture is the legacy of the Baroque and Art Nouveau periods, and then stroll around the Old Town district where you will find many baroque buildings, the colorful farmer's market and the cathedral of St. Nicholas. • Discover the mystery behind the Triple Bridge, dating from 1932, one of the most important and beautiful architectural solutions devised by Joze Plecnik. It is one of those works that confirm that their architecture is eternal and not merely part of the present. • Continue up the hill, above the city, by funicular and enjoy the tour of the old medieval fortress Ljubljana Castle, with its imposing tower. You can explore the grounds of this imposing building and enter the tower. 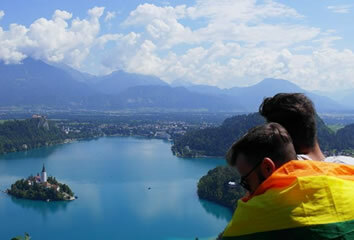 Some say the best views in Slovenia can be found at the top of the tower! • You will have then some free time to explore beautiful streets on your own or just enjoying coffee on the banks of Ljubljanica River. • The evening will be free for night exploration of the city. • Dinner on your own and overnight at your hotel in Ljubljana. • Buffet Breakfast and procede the tour to Bled and explore the castle on the top of the cliff and the famous church from 17th century on the small island in the middle of the Bled’s lake. • After lunch on your ownwe will head to Postojna Cave to enjoy its spectacular stone formations. • Only few kilometres away from the cave we will visit Predjama castle with dramatic setting in the gaping mouth of the mountain. • Dinner on your own and overnight stay at your hotel in Ljubljana. • Buffet Breakfast and departure from Ljubljana passing the Škocjan Caves / Lipica stud farm, stop in Piran, a small and gorgeous fisherman’s town, a pearl of the Slovenian coast. A short erientation walk to explore the town, free time. • Transfer to Rovinj, situated on the coast of Croatian Istria. • Dinner on your own and overnight at your hotel in Rovinj. • Buffet Breakfast and afterwards you will visit a unique natural wonder – Plitvice Lakes National Park where you will enjoy the breathtaking scenery of 16 terraced lakes and spectacular waterfalls. • From Plitvice we will departure to Zadar, the historical centre of Dalmatia. • Dinner on your own and overnight at your hotel in Zadar. • Buffet Breakfast and be ready to explore the city of Zadar together with our LGBT Friendly Tour Guide. Boasting a historic old town of Roman ruins, medieval churches, cosmopolitan cafes and quality museums set on a small peninsula, Zadar is an intriguing city. It’s not too crowded and its two unique attractions – the sound-and-light spectacle of the Sea Organ and the Sun Salutation – need to be seen and heard to be believed. • Walking along Zadar's streets you will show the entire spectrum of monuments and hidden corners, into a past of than 3000 years. Stories and legends to feel the pulse of the town from the past and today's everyday living. • Buffet Breakfast and in the morning continue to Split. 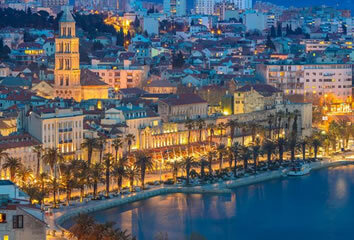 Croatia's second-largest city, Split is a great place to see Dalmatian life as it’s really lived. Always buzzing, this exuberant city has just the right balance between tradition and modernity. Step inside Diocletian’s Palace (a Unesco World Heritage Site and one of the world’s most impressive Roman monuments) and you’ll see dozens of bars, restaurants and shops thriving amid the atmospheric old walls where Split has been humming along for thousands of years. • Dinner on your own and overnight at your hotel in Split. • Buffet Breakfast and be ready for a special LGBT Friendly guided tour of Split. • Explore its beauties and culture: the second largest Croatian city, situated on the shore of Adriatic Sea. • The historical centre is full of beautiful monuments: UNESCO Diocletian’s Palace (entrance fee included), the Cathedral, medieval fortifications, Gothic palaces and more. • Buffet Breakfast and morning transfer to Dubrovnik - the most breath-taking Adriatic city, which is included in the UNESCO World Heritage Site list – Dubrovnik. • Do you want to live a very special experience in Dubrovnik? Enjoy in the afternoon our Game of Thrones Gay Friendly Tour of Dubrovnik, learning more about the fictional city of King's Landing while exploring its UNESCO World Heritage Old Town. • Climb the city walls (entrance fee included), picturing the bloody battles from the TV series, visiting Lovrijenac Fortress to learn about the evil exploits of King Joffrey and discovering many LGBT characters of the TV series, all this enjoying a special view of the maritime town of Dubrovnik. • The evening will be free for night sightseeing, tasting the food and feeling the nightlife of Dubrovnik. • Dinner on your own and overnight at your hotel in Dubrovnik. • Breakfast in the hotel and transfer to the Dubrovnik airport. Situated in the very heart of Zagreb, Hotel Jadran offers easy and quick access to all the sights and attractions of the city centre. Ban Jelacic Square in Zagreb is a 7-minute walk away. Free WiFi is available. All rooms are air-conditioned and feature a flat-screen TV. A working desk is provided as well. Every unit also comprises a private bathroom with a shower and a hairdryer. A buffet breakfast is served at the hotel. Guests travelling with pets may request a dog bed, food and water bowls and a floor mat for pets, subject to availability. Just 200 m from Jadran Hotel there is a public parking garage. Cvjetni Square is a 10-minute walk from the hotel while Zagreb Cathedral 600 m away. Zagreb Airport is 20 km from the hotel. Situated in a historically protected building and partially refurbished in 2017, B&B Hotel Ljubljana Park is within short walking distance from Ljubljana's city centre and major tourist attractions. With its view of Ljubljana Castle and the central railway and bus stations just 800 m away, guests can take advantage of the convenient location, while also withdrawing from the colourful city bustle and resting for a moment amongst green natural surroundings. Hotel Katarina is situated on a wonderful island opposite the historical core of Rovinj. The island, sharing its name with the hotel, is the second biggest island within the Rovinj Archipelago. Katarina is the island closest to Rovinj where you can enjoy an exclusive stay in a retro-style historical hotel, swimming in a pool or hidden-away island coves, a lunch by the beach, sports activities, or walk through the Mediterranean gardens. After a 5-minute romantic boat trip, continue your stroll along the narrow streets of Rovinj’s old town centre. It features abundant Mediterranean vegetation, promenades and 19th-century parks boasting magnificent views of the town, of the Zlatni Rt park forest and the rest of the Rovinj Archipelago. It is also distinctive for the historical remains of an old castle integrated in the hotel, giving it a touch of the Austro-Hungarian Monarchy. The Mediterranean-style Hotel Delfin, in the attractive Diklo area of Zadar, offers en-suite rooms and a covered outdoor restaurant terrace, just 10 m from the sea. A public bus stops right in front of the Delfin Hotel and provides for easy access to the city centre with buses passing by every half hour. All rooms are equipped with free internet, satellite TV, air conditioning, and most have a balcony with a sea view. Panoramic views to the sea and the islands beyond can be enjoyed from the restaurant's covered terrace. After a typical Dalmatian dinner at the Delfin restaurant, guests can take a romantic stroll along the shore. Most of the bright and comfortable rooms offer private balconies with panoramic views of Split. The rooms overlook church towers, narrow Dalmatian streets and Marjan Hill. Guests can start their day with the continental breakfast served each morning in the restaurant or in the room, and the service is free of charge. Guests of the Slavija enjoy reductions at some of the nearby restaurants. The port of Split and the main train and bus station are 300 m away. The airport bus stops 200 m away. The Slavija Hotel is right next to the Jupiter Sanctuary, and only 40 m from Split Cathedral. Valamar Club Dubrovnik Hotel on the lush Babin Kuk peninsula offers an easy access to the Old Town of Dubrovnik. The whole hotel is air-conditioned and the rooms offer all modern amenities. Free WiFi is available throughout the hotel. The large swimming pool, the multitude of sports courts, aquatic sports nearby at the beach and organised entertainment programmes for a pleasant vacation. The all inclusive light offer includes a rich buffet breakfast, lunch and dinner with drink during the meals. Valamar Club Dubrovnik Hotel offers the Maro Club for children, while somewhat older guests will enjoy the relaxing atmosphere of the lobby bar with a spacious sea-view terrace.